There are two types of tissue surrounding the tooth, gingiva (gum tissue) and mucosa (cheek tissue). Gingiva is a tough leather like tissue whereas mucosa is very flexible and delicate. In the early stages of recession, the zone of gingiva thins. A normal zone of gingiva is 3mm or greater. When the zone of tissue becomes less than 3mm there is a greater risk of recession. Zones less than 3mm are considered unstable. The primary goal of a gum grafting procedure is to increase the zone of attached tissue. The secondary goal is to try to cover exposed tooth root surfaces. 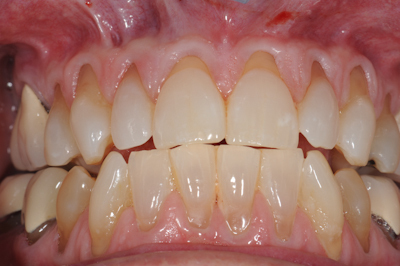 Even if the second goal cannot be met, by establishing an adequate zone of attached gingiva the recession can be arrested and maintained at their current levels. Other contributing factors such as those above must also be addressed. One technique that can be employed to achieve both goals is a periodontal plastic surgery procedure called gingival tunneling. There are limitations to how much root coverage can be obtained. Usually the height of the gingival papillae, in-between the teeth, is the standard benchmark. As a rule you cant achieve root coverage beyond the height of the papillae and typically it is a few millimeters less. In this case, there is severe gingival recession. Abrasion on the root surfaces is indicative tooth brush trauma. This type of trauma is from using a toothbrush with hard bristles instead of soft, over zealous brushing or improper technique – using the toothbrush in a side to side motion instead of up and down. 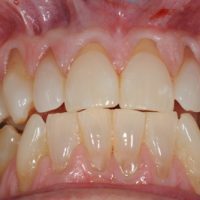 The good news about this case is that the gingival papillae in-between the teeth are almost at normal height, thus this patient is a good candidate for a root coverage procedure. A gingival tunnel procedure is used. Given the extensive nature of the gum recession we opted to use Alloderm dermal matrix tissue instead of the patient’s own tissue from the roof of the mouth. We also used Platelet Rich Plasma to rehydrate the Alloderm tissue and facilitate healing. After a local anesthetic is used The roots are scaled and planed smooth. A gentle incision is made between the gum and tooth. The incision does not extend through the side gingival papillae, they are still attached. The gum is then separated away from the tooth and that creates a tunnel. The Alloderm tissue is advanced through the tunnel by threading a suture under the papillae. Once the tissue is in place, the gingival flap is re-approximated higher on the tooth root surface and sutured in place using a sling suture design. Platelet rich plasma is also applied around the incision area once suturing is complete. We achieved a very favorable result. At one week there has been almost complete root coverage. The patient’s tooth brushing technique has been modified and a soft toothbrush is being using.